Dare to Go Bold With Your Makeup? I’ll admit that when it comes to my makeup I’m a total neutral woman. I probably have five taupe eye shadows, and three shimmery champagne colors, and three soft brown shadows. As a blogger I always try and step outside of my comfort zone and try something completely different. This is where Mehron comes in. If you’re unfamiliar Mehron is a cosmetics brand that offers some of the boldest and brightest eye shadow shades. They’re pigmented, blend nicely, and with the right primer and base, stay put all day. This is my first time trying the brand and I’m absolutely impressed. I was sent four Intense Pro Pressed Pigments ($11.50) in the shades: Yellow Spark, Night Sky, Electric Green, and Inferno. With the pressed powder pigments you’re getting long-lasting matte shades that you can use on your eyes, hair, and body. There’s a huge range of fun, bright colors that I think a lot of people would enjoy. The matte texture is easy to blend, and you can pop them in with your neutral shadows as a way to ease yourself into bold shadows like these. I also got to test out three Precious Gem Powders Loose Pure Pigments ($10.50) in the shades: Amethyst, Turquoise, and Emerald. These come in a small round container that has a sifter. You definitely have to be careful with these! Just getting swatches I made a huge mess in my office. This is something that happens anytime I use pigments. 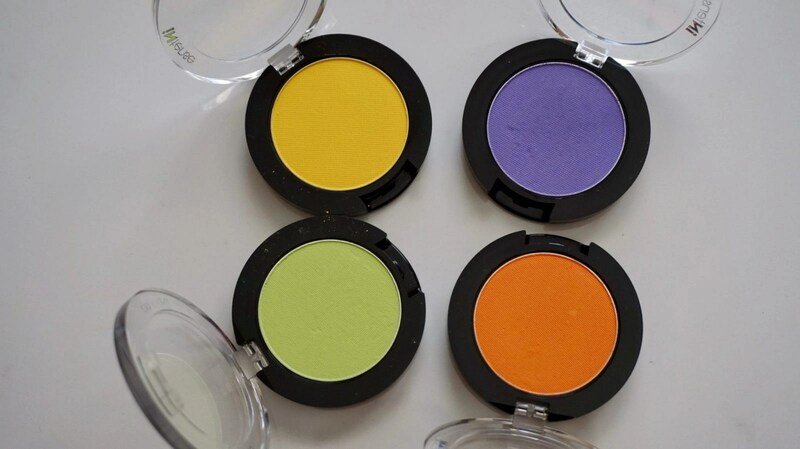 These pigments are insanely pigmented, and have a lot of versatility to them. I applied these on top of my MAC shadows to add a little shimmer to my eye look and I love it. These work well on their own, but you’ll definitely need something to help them stay put. Between my eye shadow primer and a base, they stay put fairly well. Lastly is the Prime and Behold Professional Primer for Color Cosmetics from Wunder2 ($22). This primer is going to lock any color pigment to the skin, while intensifying the color and ensuring that it’s waterproof, transfer-proof, and smudge proof for up to 24 hours. I don’t think the primer helps make the shadows last 24 hours, at least not on me. While it did lock the shadows into place, I wouldn’t stay that it intensified the shadows. I will say that this particular primer worked better with the Mehron shadows than my NARS and Smashbox eyeshadow primers. I would try your current eyeshadow primer with the Mehron eye products and if they don’t work well, pick up the Wunder2 professional primer. Overall, I’m absolutely loving these Mehron shadows and they’re the perfect bold colors for the summer. I already have my eyes on a few other Mehron products that look amazing! Do you have any favorite Mehron products? Let us know in the comments below!